Last night I finished stitching With Thy Needle and Threads Springtime Messenger design.. 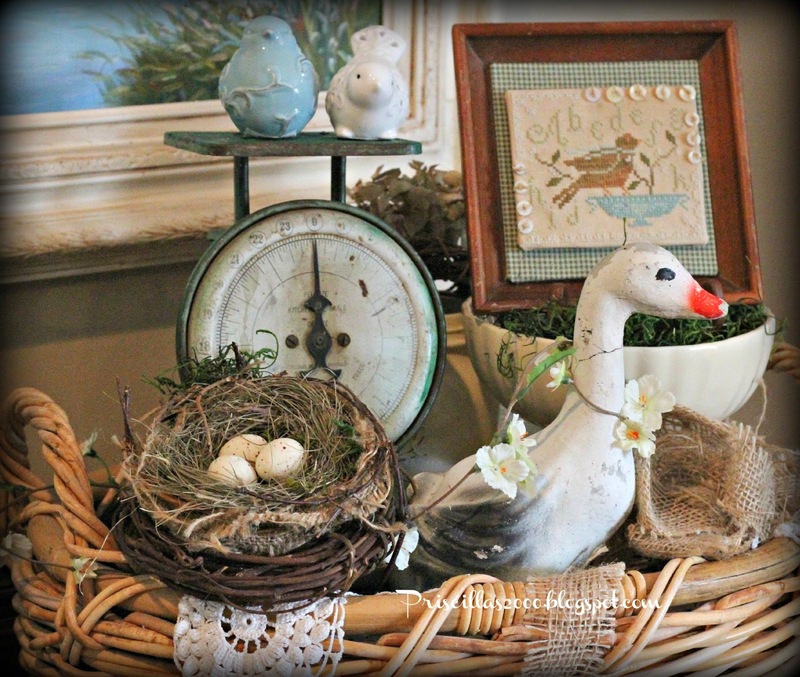 I used mostly DMC floss for the design except for the bird.. and I changed the color of the urn to aqua blues instead of greens.. I framed it using a church rummage sale frame ( 50 cents) it's pretty chipped up and even has some paint splatter on it ...but I kind of like it that way to go with all the other vintage and chippy things in this basket..I mounted some green check fabric on a piece of needlework sticky board that would fir the inside of the frame on the top .. The frame was too deep to use if I were to traditionally frame the piece.. Just didn't look right. Then I used the sticky needlework board for the stitching and just hot glued it on. It is sitting in an easel on top of a bed of moss in a pedestal bowl.. I also glued the buttons down instead of sewing them .. Then I used a thread from some burlap ..tied little knots in it and glued to the top of each button..
Just so adorable. Love everything about it. You have been busy! Nice finish there! You are an incredible stitching machine with eyes like an eagle! Just amazing. 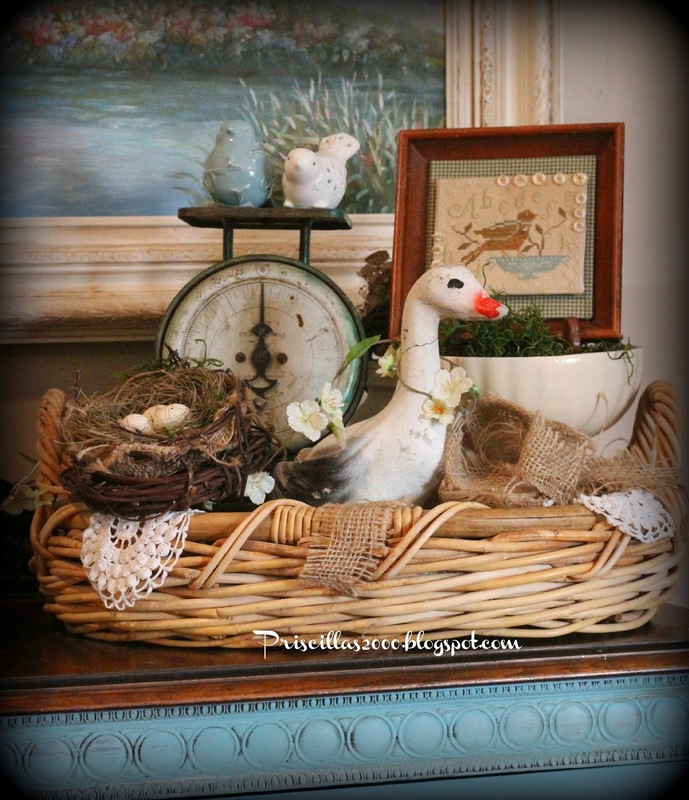 Another darling finish, Priscilla--it looks so great in your "basket of spring!" I just love the way you use those make-do frames! The whole setting is cheerful and so Spring-like! love the buttons on the stitchery! So sweet! 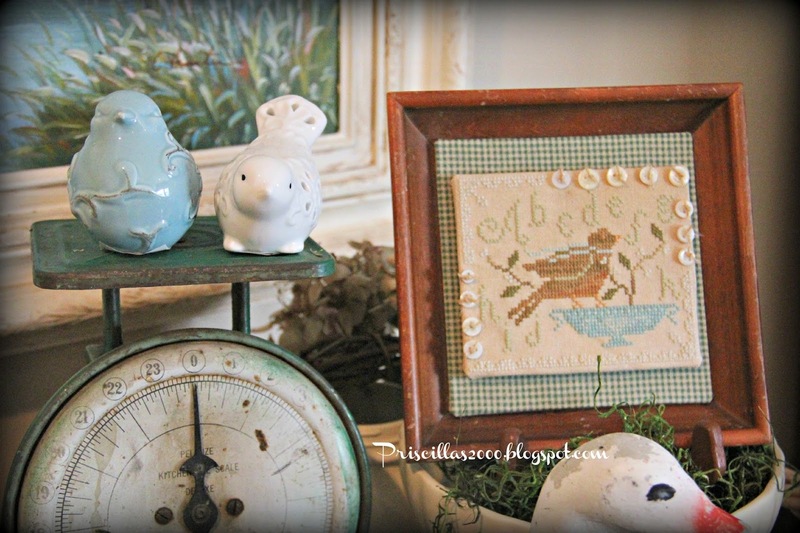 Oh, how sweet and I love your vignette too! Thank you for your advice about my table. Spring in stitches - I love it especially the button accents. Stopping by from Jann's, cute really cute. It so hard to get into spring since we've buried in snow! Your vignette is really cute. Playing catch up with you!! Love this!! You are the queen of display as i have mentioned before!! 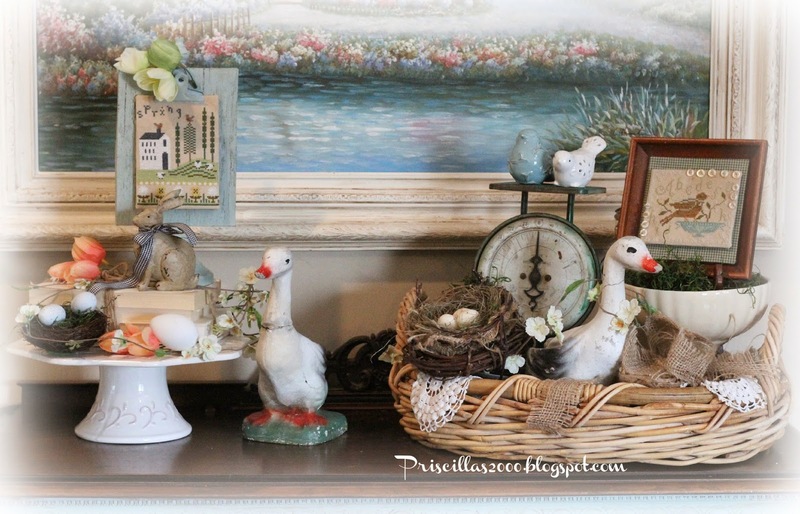 Priscilla, love this sweet vignette! 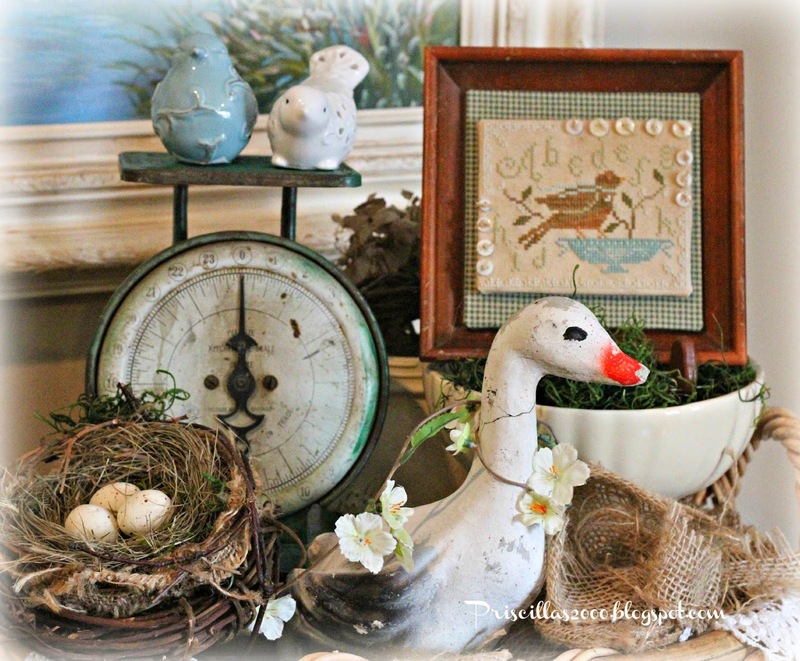 Your stitching is simply darling and I adore that rustic duck! Thanks for sharing with SYC.